The OneTaq One-Step RT-PCR Kit offers sensitive and robust end-point detection of RNA templates. cDNA synthesis and PCR amplification steps are performed in a single reaction using gene-specific primers, resulting in a streamlined RT-PCR protocol. The kit combines three optimized mixes: OneTaq One-Step Enzyme Mix, OneTaq One-Step Reaction Mix and OneTaq One-Step Quick-Load Reaction Mix. The Enzyme Mix combines ProtoScript II Reverse Transcriptase, Murine RNase Inhibitor and OneTaq Hot Start DNA Polymerase. ProtoScript II Reverse Transcriptase is a mutant M-MuLV reverse transcriptase with reduced RNase H activity and increased thermostability. 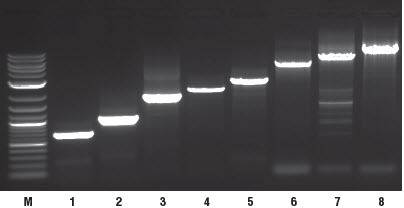 OneTaq Hot Start DNA Polymerase is mixture of a Hot Start Taq DNA Polymerase combined with a proof-reading DNA polymerase, resulting in high-yield amplification with minimal optimization. The OneTaq One-Step RT-PCR Kit is capable of amplifying long transcripts up to 9 kb in length. Two optimized reaction mixes are included, OneTaq One-Step Reaction Mix and Quick-Load OneTaq One-Step Reaction Mix. The reaction mixes offer robust conditions for both cDNA synthesis and PCR amplification. The unique OneTaq Quick-Load One-Step Reaction Mix contains additional dyes, offering color indication for reaction setup as well as direct gel loading. Both total RNA and mRNA can be used as template. The kit can detect a GAPDH target as low as 0.1 pg per reaction. It can routinely detect RNA targets up to 9 kb. The OneTaq One-Step RT-PCR Kit is capable of multiplex detection of two or three targets. Figure 1. Detection of RNA templates of different length. About 100 ng of Jurkat total RNA was used in 50 μl reactions following the standard protocol. The target sizes were Lane 1: 0.7 kb, Lane 2: 1.1 kb, Lane 3: 1.9 kb, Lane 4: 2.3 kb, Lane 5: 2.5 kb, Lane 6: 5.5 kb, Lane 7: 7.6 kb and Lane 8: 9.3 kb. The marker lane (M) contains Quick-Load 1 kb Plus DNA Ladder (NEB #N0469). Figure 2. Sensitive detection of RNA down to 1 pg. Serial dilution of HeLa total RNA (Lane 1: 1 μg, Lane 2: 100 ng, Lane 3: 10 ng, Lane 4: 1 ng, Lane 5: 100 pg, Lane 6: 10 pg, Lane 7: 1 pg, Lane 8: 0.1 pg) was used in 50 μl reactions following the Standard Protocol. The marker lane (M) contains Quick-Load 1 kb Plus DNA Ladder (NEB #N0469). Sambrook, J. and Russel, D.W. (2001). Molecular Cloning: A Laboratory Manual (3rd Ed.). Cold Spring Harbor: Cold Spring Harbor Laboratory Press. Sellner, L N. and Turbett, G. R. (1998). Biotechniques. 25, 230-234. How do I choose between One-Step RT-PCR and Two-Step RT-PCR protocols? What’s the difference between NEB #E6560 and NEB #E5315? How does One-Step RT-PCR kit protocol work for NEB #E5315? Can I use a 25 μl reaction volume rather than a 50 μl reaction volume using NEB #E5315? What conditions should I use for cDNA synthesis? Do I need to optimize the reaction components? How much RNA template should I use? How should I design my primers? What’s the recommended primer concentration? How many PCR cycles should I do?